The Fiji islands are known for their friendly natives and good natured spirit and outgoingness of their people. Set in the South Pacific, Fiji is made up of over 300 islands, although most visitors touch base on the main 2 islands, Viti Levu and Vanua Levu. Kava is the national drink of Fiji, and is also used widely by other South Pacific nations such as Tonga, Samoa and Vanuatu. Made from pounding the roots of the Yaqona plant (Piper methysticum) and infusing the powdered kava root with water, the drink produces a mild sedative and anesthetic effect, as well as a mild euphoria. 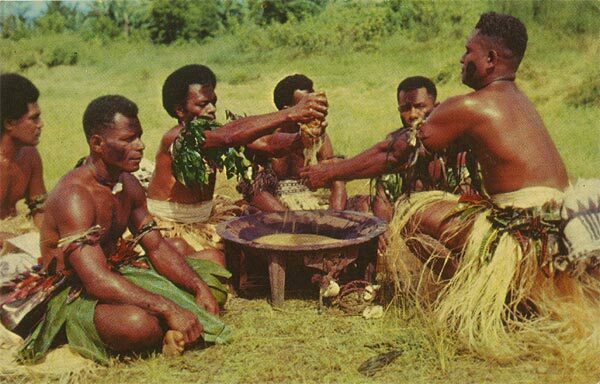 Drinking Kava is a social pastime, although it also serves a role in traditional customs related to tribal society. Having made several trips to Fiji, I have always enjoyed experiencing the kava drinking with the locals, both at the resorts as well as in the villages. Fijian village life revolves around a strong sense of family and community, with the presence of a local chief in each village or province. Fijian villages consist of modest dwellings, and some of the villagers still live in thatched roof homes. Each village typically has a small church and a larger community building where the villagers may gather to eat, celebrate and welcome guests. We visited Navula Village, on the banks of the Sigatoka River with a member of the staff from our hotel. This village has only recently accepted visitors and we were received warmly. The looks of joy and wonder on the faces of the children in itself made the trip worthwhile. As a tradition it is customary to bring a gift of kava roots to present to the chief upon our arrival. Once accepted and welcomed, our entire group sat cross legged on the floor opposite the chief and his assistants, who were already mixing up kava in a large wooden bowl in anticipation of our arrival. The kava preparation is and presentation is done with much ritual: chanting, clapping of hands and blessing. Upon receiving the kava, served in a coconut shell bowl, the participant claps their hands one time and proclaims “ Bula!”, the Fijian greeting which denotes several meanings, (similar to “Aloha” in Hawaiian). The kava is drunk in one gulp, and then the bowl is returned to the host, followed by clapping three times. The kava drink has the appearance (and some say taste) of muddy water. Upon imbibing the drink, we felt a noticeable mild numbness of the tongue and guns. After several bowls, a feeling of very light intoxication and overall well-being set in. After and during the kava drinking, many members of the village broke out guitars and serenaded us with their lovely voices. The multi-part harmonies and moving melodies sung by all ages could only be described as heavenly. No gathering is complete without food, music and dance, and after serving us a family prepared meal of local fruits, leafy vegetables, starches ( cassava, taro, potatoes) chicken and fish, we were all encouraged to get up to dance traditional style with our hosts. With a full belly of kava and the delicious lovingly prepared Polynesian style food, no one dared turn down the invitation to strut to the music and learn a few local moves. Kava is part of daily life in Fiji, both in villages and in urban areas and across all classes and walks of life. ‘Having a grog’, as drinking kava is sometimes known, is used for welcoming and bonding with visitors, for storytelling sessions, or merely for passing time.